BooWate is a free puzzle platform game developed by the indie French team Cyber@One Productions. Featuring a clean and attractive aesthetic that some may compare to games such as Portal and Quantum Conundrum, this is a game based on physics and puts the player’s skills to the test across several rooms. The goal is to reach a button that ends the level, but it’s not as simple as it sounds. A simple fixed screen tutorial teaches us the ropes before we venture into the demanding puzzle world of BooWate. 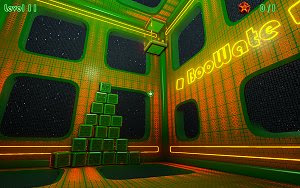 The player has to use the boxes that are scattered across the levels to overcome the puzzles and reach improbably high places. Making piles of boxes is something that may lead to a lot of frustrations, since one misplaced box may topple all the others that took quite some time to arrange. But that is part of the fun of BooWate, since the levels are timed and the best players will feel challenged to beat the best times. BooWate could be improved in some areas, but those are not really related to the appealing design of the game itself. The menus, for one, are beautiful to look at and intuitive, but the transition between each one takes more time than it should. Worst still is the obligation to change the keyboard layout from qwerty to azerty, something that has to be done through Windows. A simple option to configure the keyboard controls in the game would spare many players to what can be a frustrating move. However, those who get to fully enjoy BooWate and are fans of mindbenders are in for a treat. This is a competent, clever and demanding game.